The musical experience that will start today and go on until Saturday 3rd June gains ground in the digital world and will reach audiences all around the world thanks to Primavera Sound’s official stream, which for the second consecutive year can be followed on the Festival’s channels and on Red Bull TV. A virtual event that will offer a different way of experiencing live music, thanks to a selection of concerts that will take place on the four main stages combined with exclusive material focusing on the hidden facets of artists. Two separate channels, the schedules for which are now available and will be updated every day with new names, are designed to cater for all tastes: Channel 1 will have an uninterrupted programme hosted by the British presenters Will Best and Julie Adenuga, DJ for Beats 1 and sister of Skepta, and the popular music lover and foodie Johann Wald. The second cannel will focus on the concerts of the day, and will also gather all the alternative contents that can only be enjoyed by following this broadcasting: interviews in the studio and at strategic points around the site, intimate acoustic shows and confessions on wheels in the Golf Karts section and of course all the surprises that will take place in the next few days. 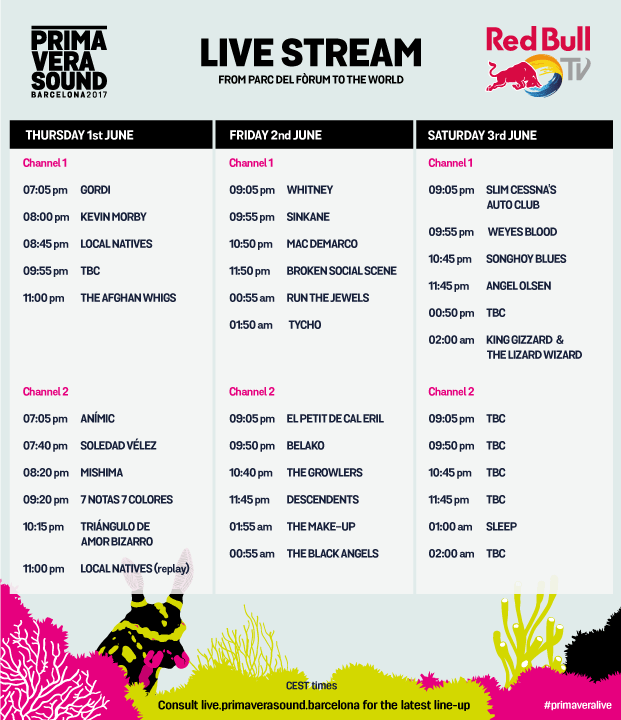 All the contents will be presented in an uninterrupted transmission that will cover all time zones and can be followed on the Primavera Sound website, the official app and all the Red Bull TV channels on mobile devices (Android and iOS) and Smart TVs. Also, the best moments of the festival can be re-lived when it is over as exclusive a la carte video content.